Please DM us to claim your prize. Hey everyone! Welcome to NintendoSoup’s 30th giveaway! This week, we’re giving away not one but five copies of platforming puzzle game TurtlePop: Journey to Freedom for Nintendo Switch! Win a copy of #TurtlePop for #NintendoSwitch. 2 copies to be won! 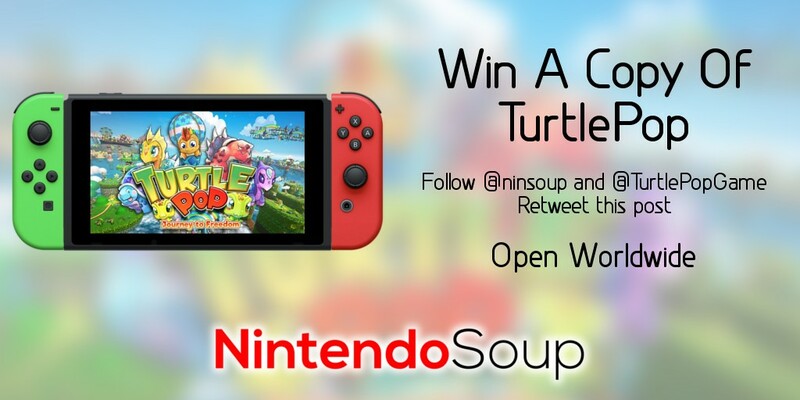 Follow @ninsoup and @TurtlePopGame, and Retweet to enter. Open worldwide, ends August 13 6am PT. Giveaway ends August 13, 2018 6:00am Pacific Time. 3 winners will be randomly selected on Facebook, while 2 lucky winners will be chosen on Twitter. Game will be sent as a download code, redeemable on the North American region Nintendo eShop. Open to everyone worldwide.